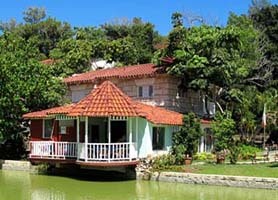 A visit to Varadero Cuba is not complete without a visit to this beautiful park and lush gardens. Our Jessica Gutierrez from the Havana office of VaraderReviews.com visited the park in October 2013 and this is her review of Parque Josone Varadero. 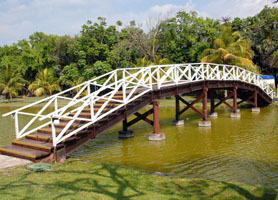 Josone Park, Varadero, is characterized by its extensive gardens with a pleasant fresh water lake over which a large arched bridge (see photo of Jessica) spans. The park is an oasis for migrating birds that nest in the trees within the park and also the resident ducks and swans that live here all year round. Over recent years, the manager of the park has slowly included other bird species like macaws, parrots, flamingos, and even ostriches. 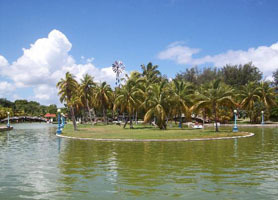 The Parque Josone Varadero history dates back to 1935 when then director of the Arrechavala rum factory, a Spanish immigrant from the Basque region businessman José Fermín Iturrioz bought one of the first plots of land in Varadero, situated around a natural lagoon that is today the parks lake . 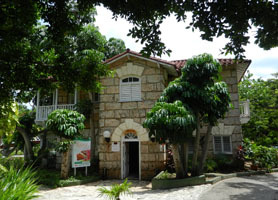 The first house was built in 1938 followed by the neoclassical style mansion which is today the park’s main building, restaurant, souvenir shop and cafeteria. Mr. Iturrioz and his family lived in the mansion; while the smaller house (now a restaurant looking out over the lake) were the servant’s quarters. One of the odd quirks of the park underlines Mr. Iturrioz´s obvious eccentricity. The Varadero Beach is just 60 meters from the entrance of Parque Josone by simply crossing, what was then, an empty street. However, the owner dedicded that walking out over the 60 meter strech was not private enough so he built a tunnel, from his house, to the sea… This tunnel remains to this day and brings those who enter it out to the diving center located at its mouth. 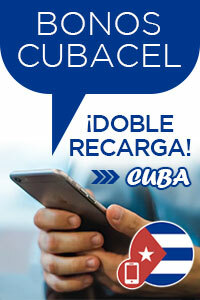 The Josone Park Varadero is a special place in the Varadero Peninsula, not to be missed if you are vacationing here. 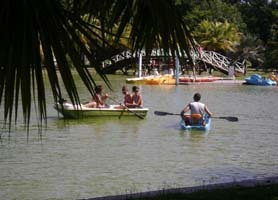 This park is composed of a beautiful artificial lake with rowboats available to rent. Four excellent restaurants are strewn across the grounds. First up is the “Dante”, offering Italian food. Second is the “La Campana” serving Cuban Creole food (can anyone say Black beans & pork?). Third is the restuarant “Antiguedades” which serves a large menu of local caught fresh seafood. Finally, there´s the El Retiro which serves a nice mix of international food. For the kids, there’s bowling, shooting range, boating on the lake, and a large pool, all on the walled property of nearly eight acres. The manager, with whom I spoke, says that each year over 500 000 tourists visit this park but, many don’t even know it exists.., so that’s why I thought I’d give you all a heads-up. I think his numbers are a little overzealous judging by how quiet and tranquil the Parque Josone Varadero felt to me but, the park is truly a masterpiece and well worth the visit. The best part is Admission is free! !